While April is traditionally one of the rainiest months of the year, it is also the time that many members of the 500 Home Run Club® let loose a torrential flood of homers that propelled them past the 500 home run barrier and into immortality. 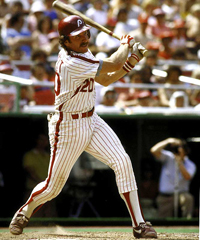 “Iron Mike” Schmidt was the personification of talent at the hot corner, possessing a combination of raw power, batting skill and defensive finesse. His brute strength enabled him to lead the league in homer eight times, and rack up more than 500 career home runs. His 500th home run came on April 18th, 1987 to give his beloved Philadelphia Phillies a win against cross-state rivals The Pittsburgh Pirates. The Phillies had a comfortable 5-0 lead over the Pirates, but Pittsburgh rallied for six runs in the bottom of the eighth to take a 6-5 lead. In the ninth, Juan Samuel kept the game alive for the Phils with a hard slide into second base to break up a potential game-ending double play. After a walk to Von Hayes, the Phillies had two on and two out, and Schmidt came to the plate looking for his 500th homer and a chance to win the game. After Pirates reliever Don Robinson fell behind 3-0, Schmidty pounded the next pitch over the wall in left for No. 500 and an 8-6 Phillies victory. 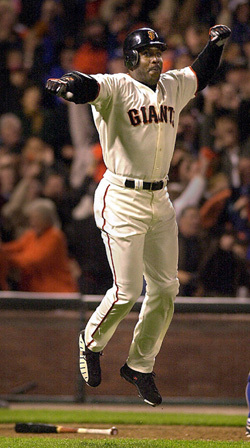 After the game, he told reporters the homer was "the greatest thrill of my lifetime." After living in the national TV spotlight for the second half of the 1998 season, as he joined in lock-step with St. Louis Cardinals first baseman Mark McGwire in their spectacular pursuit of Yankee great Roger Maris’ single-season MLB home run record, one would think Sammy Sosa was been immune to the pressure of hitting landmark home runs. But after sitting on 499 long balls for the entire 2004 off-season, Slammin’ Sammy was one of the most excited members of the Cubs squad visiting the Reds for their inaugural home stand at the brand new Great American Ballpark. On April 4, 2005, Cub Nation’s beloved No. 21 crushed the magical No. 500 off Cincinnati Reds’ reliever Scott Sullivan in the top of the seventh inning. Sosa's got all of a 1-2 fastball at the knees and he ripped it over the right-center field wall. 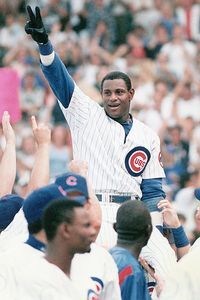 Sammy Sosa’s 500th home run came on the same day as Barry Bonds’ #615, but that didn’t diminish the significance for Sosa, who took extra pride in being the first Latino player to achieve the legendary plateau. This [hitting #500) was very special for me, especially since my family was here watching. That's something that I never will forget,” said the ever-smiling Sosa. “When I made contact I was like 'Wow, I knew I got it, that's it, that's (number) 500.’ Then, when I got to home plate I thanked God because I don't have to go up there every at-bat thinking of hitting the ball out of the park."